ight at the very edge of visibility, I can make out a huge shape lying on the sand. Could it really be the impressive Leopard Shark or just a low hunk of reef? As I cautiously inch closer , my first impressions are verified. A massive three meter Leopard Shark! What a sensation! Stopping three meters from the shark. I am able to get a clear impression of this magnificent creature. Its enormous tail is fully half the length of its body. The flattened head ends with a mouth close to the end of its body, an unusual feature for sharks. 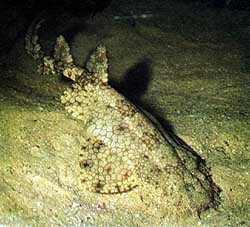 The Leopard Sharks are more interested in octopuses, shellfish, prawns and even small fish. I can even see barbells that help it to find food. Like most keen underwater photographers, I could not wait to get closer for that portrait. A second shark was seen nearby. To my surprise, I was able to quite close, briefly. before the Leopard Shark's head turned and its mighty tail gave a powerful sideways flick. It was gone. Fortunately, this was not the end of the encounter. None of the divers in our group could decide whether we saw eight Leopard Sharks on this dive or the same two sharks several times. They are curious and certainly did make several passes around and above us to have a "Captain Cook", (a look) as the saying goes. This shark is known as Stegostoma fasciatum to biologists. They are more closely related to Wobbygongs, Tawny Nurse sharks and Whale sharks. They have a broad and blunt head with a pale yellow colored body. Many sharks have a ventral mouth well suited to predatory lifestyle. This one has a mouth closer to the front just like that of a Wobbygong. A lot of light brown spots cover the body. Juveniles have zebra like stripes and many people call them Zebra sharks. The sandy color gives them incredible camouflage. As I mentioned above, they are difficult to discern from a distance because of the similarity in color to sand. The tail fin has strong side ways grooves and is enormous, fully half the length of its body. Gills are very large and well spaced. The pectoral fins are very broad, typical of a shark designed for saving energy by gliding the maximum distance possible. They congregate around Christmas time at Cook Island each year. After mating a large round egg case is deposited on the sea floor. Like a lot of bottom dwelling sharks, they make a habit of sitting very still on the sand and waiting for prey to come close enough to catch. This is a more energy efficient way to find food. Ten meters further east, an enormous Bull Ray rested on the sand. This ray was well over two meters across the body. Its tail was as thick as a man's leg and the poison barb was thirty centimeters in length, well big enough to dispatch a mere rubbed clad diver. Fortunately, big rays have the confident air of power and tolerate a diver who approaches close. The big female ray merely ignored us. Across in the direction of the open water, two Eagle rays glide by displaying their extremely long tails. Once the excitement of the dive has subsided, we get the chance to have a closer look about. These reefs abound Cook Island are both a pleasure to dive and a place of some sadness. The marine life is rich and varied but the impact of a huge population of the Gold Coast has taken its toll. Many locals can tell you stories of what fish life was like years ago. One of the most vivid examples concerns the Parrotfish. They are supposed to be quite common here but I have never seen any sign of them in my sixteen dives here. They are all too easy for spear fishermen and fishers to capture. Another reason for the relatively large impact of mankind is the close proximity of the reef to the mainland. At only six to seven hundred meters, it is within easy reach of many craft, even sea going kayaks. Whilst every one has the right to a share of the ocean, the ocean cannot keep pace with the demands of mankind. Cook Island is very obviously in need of protection. The area has rich hard corals. There are many of the major reef corals from the Great Barrier Reef. Staghorn corals, Porites corals and a large selection of Brain corals are most abundant. There are plentiful soft corals too. The combination of tropical life, temperate fish and corals is great for variety. The Brain corals are particularly rich here. They are an almost impossibly complex group of corals to grasp a deeper understanding. But during the Marine Biology course I was running at the time,, students were taught how to recognize and identify the Brain corals. The secret lies in closely examining the way that the polyps are displayed within the underlying coral skeleton. This is known as the corallite. 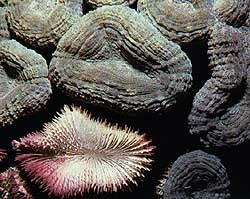 Some corallites look like buttons whilst others look like valleys and ridges. It is a fascinating process to gain some degree of mastery over coral identification. Unfortunately, there is not time to explain the intricacies here. Suffice to say, that after a few moments of explanation, anyone can learn to identify the main types and distinguish each of the hard coral groups. Some insights can be gained from observing the large polyps of the Favia, which has distinct polyps often with a green valley within. Then, there are the heavily convoluted Platygyra brain corals. The 'brain' look comes from three or four normally round corallites becoming fused into a giant corallite in which three or four coral polyps live. The overall appearance is like little valleys and ridges over a dome, that is, just like a brain. The three or four polyps share their cement coral base. 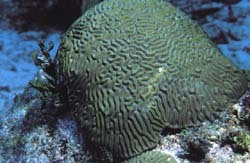 The easiest of the brain corals to recognize are the Mussidae. With their giant polyps up to twelve centimeters round, the gigantic green or red fleshy polyps are unmistakable. In addition, lots of the Turbinaria plate corals can be found here. These have more in common with the Sydney Solitary tooth corals and can survive quite well in dirty and cooler water. A close examination of a Turbinaria plate coral shows the very clear to see, elevated coral polyps. They look like they are built on a long stem that rises well above the flat plate like leaf of the main colony. Turbinaria corals can tolerate turbid water because of the polyps habit of growing on top of the stem. Think of a roof top garden to get the general idea. 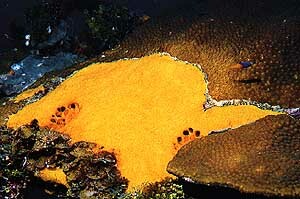 The war between sponges (yellow) and corals (brown). Observe the "no man's land" between them. In amongst the corals lie many sponges and soft corals. Because the density of life is so great, there is usually a severe shortage of living space. It is always interesting to observe the interaction between adjacent corals and sponges. Most divers see nothing special here. But right before their eyes is a grand battle that has been fought for many millions of years. Sponges and corals have been at war since before the time of the dinosaurs! They are undertaking silent but deadly struggle against each other. The sponge has an arsenal of toxin chemicals that it exudes in the direction of the coral. It is very effective in killing off corals. Corals on the other hand are able to fight back with counter chemicals and polyps capable of stinging the sponges. Although not as overtly impressive as Star Wars, it still remains a deadly struggle for survival. This timeless drama has been occurring for many millions of years in the oceans. In fact, almostly the entire Great Barrier Reef, was once dominated by hard massive limestone sponges. These are common in the fossil record. Today of course, the corals are ascendant. but there are still many sponges able to survive in the coral jungle. You do not have to look far to see a coral adjacent to a sponge and to observe that the interface between them is a dead no man's land. Loggerhead Turtles are common here. They love nothing better than to snack on a juicy cunjevoi. 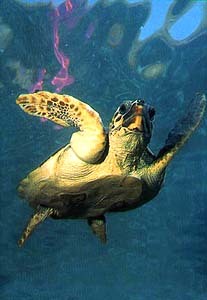 I was heartened to notice some smaller Loggerheads because, they are a yet another species in decline. The reason or reasons for which are, as yet, only speculative. What is known is that foxes are digging up the eggs that are laid on the mainland rookeries at Mon Repos. Sexing Loggerhead Turtles is simple! The male has a much more predominant tail between its rear flippers. When you check out the female tail, you may notice that it barely protrudes past the rear of its shell. The male Tail is a preponderous structure that stands out just as it does in a bull for example. There are rich populations of mollusks here. Conspicuous Sea Slugs are easy to detect. A khaki hooded Ceratosoma displayed its umbrella like cover that appears to shield its gills. Chromodorid sea slugs also are common. The reef is particularly rich in Gastropods such as Cowries. I found a superb Tiger Cowrie that was as large as an orange. Another find was the Calperna verrucosa or Toenail Cowry. This creature was resting on a piece of Sarcophyton soft coral. The Milk spot Cowrie, common around Sydney, is also abundant in the area. I was quite amazed at the similarity of the fish life to that of Sydney waters. At times, you felt as if you were diving at one of the reefs off Cronulla, as dozens of Mados. Sweep and Yellowtail scad cruised about. The Damsel fish were abundant here as well. Scalyfin Parma or White Eared Parmas were especially aggressive. You knew when you were in their territory as firm little nips and tugs could be felt on your wetsuit. I am really glad that they do not go for your skin. They are a vegetarian fish even though they are one of the most territorial of all the fish. I observed the Scalyfins to see mating pairs tending their garden of sea weed and also in the hope of seeing their mating dance. A solitary Pineapple fish could be seen in its cave hiding with a number of Roughies. 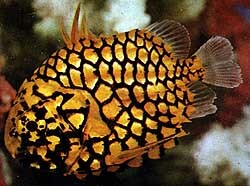 This one was the Monocentris japonicus Pineapple fish because it is known from Japan as well as down under. 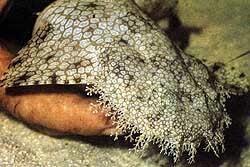 It has the same huge scales as well as the gigantic scale spines that the endemic Cleidopus gloriamaris species has. Both are a gruesome prospect because the powerful spines give it a formidable defense. The Pineapple fish have long spines on both the dorsal and ventral surface that can lock in position. This enables it to wedge into rock crevices. On the lower side of the jaw, a light organ is situated. Bio-luminescent bacteria give off a cold yellow light. The Pineapple fish is able to "turn" its light on and off by covering up the light organ with a fold of skin as it wishes. At night, they venture out into open water to feed on shrimps that are attracted to its glowing light. A night dive on Cook Island rates as first class, probably world class in a number of aspects. Apart from the regular occurrence of somniferous Turtles, there are plentiful, Painted Crayfish. The nooks and crannies beneath the coral plates and domes are ideal hideaways for the superb crustaceans. They are, of course, a favorite food of the octopus which, in turn, are the preferred food of the many Wobbygongs found in the area. On any dive, you can expect to see a dozen Wobbies or more. At night, they are particularly vigilant for the Octopuses that are their favorite food. The Wily Wobbygongs even allow Crayfish to walk over their bodies in the hope of attracting an octopus close enough to eat. This is because they know that the octopus will hunt the Painted Cray. A little calamari for dinner is heaven for the Wobbygong. A close look at the superb Wobbygong snout. During this trip, we were unfortunate enough to witness a maritime atrocity that would sicken most divers especially those who have battled for years to have Cook Island declared a marine National Park. Some fishermen must have placed some set lines on the most popular dive locations the night before and caught over twenty five Wobbygongs. They were seen filleting and beheading them on the very same wharf that the divers use to launch their boats in the Tweed River. What really added insult to the injury was the fact that we had to load our boat where twenty five Wobbygongs heads and entrails had been dumped, right on the wharf just below high tide mark. I believe the dollar return was about four hundred dollars. The dive was a little sad because of the conspicuous absence of Wobbies. Diving is a sport that manages to hold its allure to many of us for many years. This is because of the frequent occurrence of the unexpected. A slight movement in the sand revealed just one such incident at the Island. A ten centimeter crab was seen rapidly burrowing into the sand with impressive speed. After brushing away the sand a dome shaped thing ran forward and dug itself into safety in a split second, as if sinking into quick sand. A pair of tiny eyes were all that could be seen of the amazing creature, the Box Crab. All references indicated that it was known from the Philippines, not yet recorded in Australia. I picked it up. An unbelievably small crab was seen beneath a carapace shaped like a half a coconut. There was s enough room for two crabs under that shell. Two special claws resembled bulldozer like blades at the front . They were broad and splayed for their earthmoving function. The claws enabled the crab to inter itself in about one second. The claws resemble a splayed shape. Like many crabs, they were grossly enlarged and used to complete the armor like defense of the crab. The Box Crab was able to walk across the sand in the usual sideways fashion. The domed carapace looked like a giant 'Darth Vader' helmet. This crab lies in wait for food particles to approach it and grabs them from beneath the sand. In between the boulders and corals are many nook and crannies. These are where many of the smaller creatures hide. In one such crevice, I encountered several white eyed Moray Eels. They were sharing the cave which also served as a cleaning station. Tiny Cleaner Wrasse and Cleaner Shrimp were examining the Eels looking for skin parasites. These cleaner stations are most interesting to observe over the time of the dive. At the end of the dive, you are just as likely to encounter the cleaner station being occupied by Wrasse or Puffer fish. If you go back to the station day in day out, an amazing range of fish visit the station. In another crevice nearby, two common Green Morays were found jammed in so tight that it did not look possible. Some Morays are quite gregarious and thrive on communal living. In fact, different species of morays sometimes associate closely as well. It is well to remind yourself that a Moray is a fish! The large gill cover common in fish has vanished; instead, all you see is a hole. The Green Moray has distinct nostrils because it has a good sense of smell. The Moray breathes through its mouth and gulps at the water. Morays do have a lateral line for sensing low level vibrations in the water but, unlike most fish, it does not extend the entire length of its body. Instead, it ends in front of the gill opening. Zebra Lionfish , Dendrochirus zebra are common here. In my opinion, they are the more photogenic of the Lionfish. They grow much smaller than the other Lionfish such as Pterois volitans, and are probably one of the smaller Lionfish apart from the Dwarf Lionfish commonly found in Sydney. The average Zebra Lionfish grows to about fifteen centimeters. These fish have a long tentacle above their eye. The Zebra Lionfish is common fish around many parts of the world.